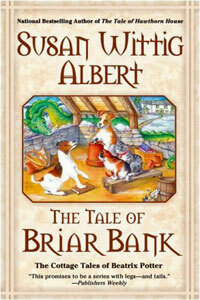 The Tale of Briar Bank by Susan Wittig Albert: Synopsis and Online Purchase Options. Synopsis (from the publisher): Near Sawrey, the seat of Miss Potter's country home, is abuzz — Mr. Wickstead has died under a tree limb. The villagers are certain that his death had to do with a treasure he dug up last spring. But why was he in the wood on a frigid night? And what of the claw marks on the limb? And what was that treasure? As per usual, the town's animals know more than the Big Folk. And only Pickles, Wickstead's fox terrier, knows exactly what happened. Meanwhile, Miss Potter wonders: can she acknowledge her fondness for Mr. Heelis and remain loyal to the memory of her fiancé? She has no time to muse, what with helping the denizens of Sawrey, human and animal — and the little matter of murder.